As a change from our usual Pack evening, we like to do an Easter themed activity afternoon at Horley Scout Camp site instead. Although we do not get all the Cubs there, due to it being school holidays and a lot of parents taking the opportunity to go away on holiday, those Cubs who did come this year enjoyed an action packed fun afternoon. 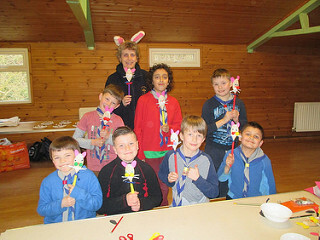 The activities took place both indoors and outdoors and included making a wooden spoon rabbit, a garden on a plate and Easter cakes as well as Easter themed games including the two favourites of hunting for the bunnies in the woods and the Easter egg hunt in the woods to search for individual eggs plus the Golden egg. A very enjoyable afternoon had by all.